OK, Ninja Boy, BioWare is finally going to give you what you've been waiting for: an RPG where the lone wolf martial arts master isn't just a supporting character, he's the star. They've been working with Microsoft Games to bring you Jade Empire, an upcoming RPG based on martial arts combat and developed for the Xbox. Set in a world based on the myths of ancient china, the story is similar to other BioWare RPGs in that you start out as a lowly apprentice and must undertake a perilous journey to figure out why there are suddenly so many evil creatures hanging around. This time around, though, BioWare won't rely on the familiarity of an established world like the Forgotten Realms, opting instead to create an original universe and build a unique RPG rule system from the ground up. Although the content is original, it's obviously deeply rooted in the traditions of both classical fantasy and the martial arts cinema. Your character comes from a place called Two Rivers (where in the Light have I heard that before?) and grows up to become a wandering martial arts hero in the tradition of Bruce Lee, Sonny Chiba, David Carradine, and a host of B-movie actors who can deliver high kicks. Powerful spirits and magic will come into play (think Crouching Tiger, Hidden Dragon) as will the Jackie Chan-like ability to turn anything that isn't bolted down into a weapon. Whether you're more interested in magic, fisticuffs, or swordplay, your primary concern will be mastering the martial arts. The thirty-plus fighting styles are broken into three schools: the Martial Arts school (based on traditional Asian styles from tai chi to sumo), the Weapons School (which is all about using classical Chinese weaponry), and the Magic School (for those who want to fling fireballs or transform into monsters). So far there seems to be no plan to give players incentive to stick to a single school. Instead, players will be encouraged to learn complimentary styles from each school, thus balancing out their strengths and weaknesses. In fact, tactical switching of styles will be a huge element of the combat system and offer a greater depth of player involvement in combat than has been seen in previous BioWare games. Although developing Jade Empire for the Xbox means console-style fighting, some aspects of the combat system will be more familiar to PC gamers. The ability to pause the game at any point during combat to switch styles or strategies has carried over from Neverwinter Nights and a new "focus ability" will allow the player to enter a slow-motion mode something like the "bullet time" originated in Max Payne (except that you get to move at normal speed). Being console-based also means that Jade Empire will have vastly superior graphics to its PC-based brethren. In fact, BioWare boasts that Jade Empire's graphics engine, which was also built from the ground up, will outshine the one used in Star Wars: Knights of the Old Republic. 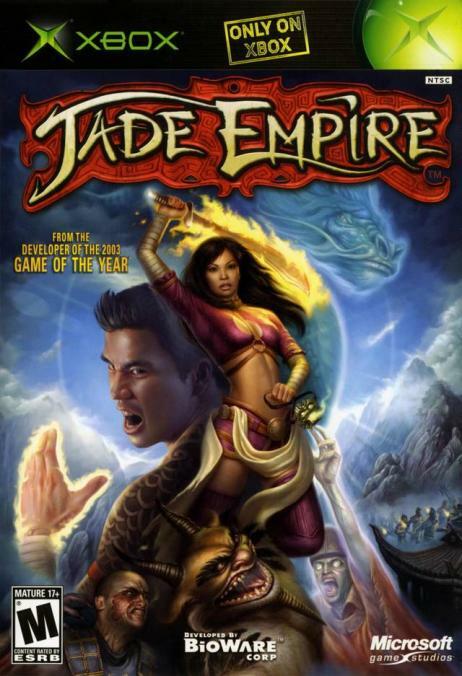 Jade Empire will reportedly have twice the number of rendering paths, character models with three times the amount of polygons, and will feature rim lighting and fully motion-captured animation. Add in physics-based cloth and collisions and you begin to feel that BioWare is trying to give the fantasy RPG genre a level of realism usually only found in simulation or war games.